The picture above shows the control for adjusting the repeat settings of the machine. 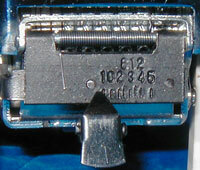 The picture to the left shows the stylus for setting the wheels and the special oil based numbering machine ink. The automatic numbering machine features metal wheels with 7 actions; repeat, consecutive, duplicate, triplicate, quadruplicate, 6 times & 12 times. The machine has drop ciphers and is finished in gleaming chrome. 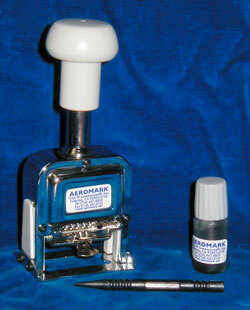 A stylus to change numbers and special oil based black numbering machine ink are included.